Fradkin & McAlpin Architects has received a 2017 Preservation Award from the Chatham Historical Society in Chatham, MA. The award recognizes the firm’s work on a Chatham property belonging to the family of David McAlpin, a principal at Fradkin & McAlpin. The award will be presented at a ceremony on May 21, 2017, at The Wayside Inn in Chatham. The goal of the project, the restoration and expansion of an early 20th century freestanding garage and apartment at 191-193 Bridge Street, was threefold. 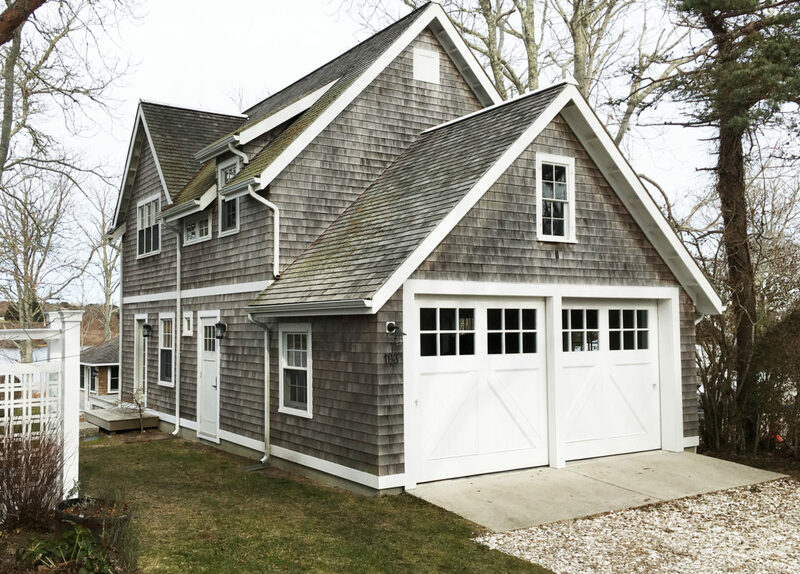 First was to create a design to preserve the early 20th century garage in keeping with the understated, “old Cape Cod” character of historic Chatham. The second objective was to accommodate year-round use, and third was to expand accommodations for a 4th generation of McAlpins. The new 1,000-square-foot cottage achieves all three objectives. Fradkin & McAlpin redeployed the original footprint of the garage, but added a second story to the structure to accommodate an efficient kitchen and a living room/dining room on the ground floor, and a bedroom, study, bath and terrace (formerly a bathroom) on the second floor. A heated basement and foundation replaced the on grade original slab. .
Several features of the original structure have been carefully replicated, including the pitch of the roof, a white water table, , six-over-six windows, a wooden deck,and the location of the cottage entry. New garage doors have been installed which replicate the originals and hang from the original sliding track. In an echo of echo the original house, cedar shingles with white trim cover the exterior. Shed dormers, an off-center entry to the cottage in a gabled portion of the façade, and an asymmetrical window pattern – all three in keeping with the style of the period in which the main house was built – have been added. The McAlpin family bought the mid-nineteenth-century, shingle-style, unheated summer home, known as Gorsemere, in 1929. Reportedly a Captain’s inn, a combination of 2 homes, the house is a coherent collection of modifications and additions in the shingle style made over 150 years. See ArtDaily for more coverage.